This page is designed to guide you as to how to use the Scutify app. It provides useful hints as well as frequently asked questions. What can I use Scutify for? How do I post Scuttles? How do I tag a company in my Scuttle? How do I tag a FX pair in my Scuttle? How do I tag a stock index in my Scuttle? How do I embed a YouTube Video in my Scuttle? How do I embed a SlideShare presentation in my Scuttle? Sentiment Rankings - how does it work? What web browsers do Scutify support? What is the Scutify Trending 20 Index and how does it work? How do I set up my Bitcoin QR Code on my profile? Scutify is a social aggregator of scuttlebutt for stocks, FX and commodities. What does that mean? Basically we collate all the talk and chatter around these asset classes and present to you what is trending at this very moment. The Scutify app will allow you to stay on top of what is happening on your favorite stocks, FX, indexes and commodities. Read all the latest happenings before the mainstream news outlets run the story. Watch the latest videos and participates in the gossips too. You do not have to be a member to use Scutify. You are free to browse the content of the app or website without being a member, but membership allows you to create Scuttle List (watchlist of stocks) as well as post Scuttles on the website or app. Scuttles are comments posted by members of Scutify. They are similar to tweets but they only live inside the Scutify app/website. First you need to be a member of Scutify. Go to your dashboard and there is the ability to add Scuttles (i.e. comments) in a free textfield. Like Twitter, Scuttles can only be 280 characters long. Enough for you to write something descriptive unlike tweets. To tag a company simply use the company's ticker with a $ symbol in front. For example Apple Computers would be $AAPL. For UK stocks, simply put $LON: before the ticker and for Australian stocks it would be $ASX: before the ticker. Flick through the 5 page presentation below which outlines how to embed a video into your Scuttle. Flick through the 5 page presentation below which outlines how to embed a presentation into your Scuttle. Sentiment Rankings allows you to see what the Scutify community thinks about a stock - i.e. whether they are bearish or bullish. Simply pick a stock, determine whether you are bullish or bearish and finally pick a time frame for your view. The current price is recorded when you make a call. After the sentiment call has expired, your call will be either in profit, break even or at a loss. This will be recorded against your name and you will be ranked against other Scutifiers, All-Stars and Anonymous users. All calls are based of closing price for the expiry day (if expiry day is not a trading day, then it will be the next available trading day). Just a note on daily calls: If you make a 1 day call during market hours, the call will expire at close of markets the following trading day. If you are unsure as to how it all works, please contact us and we can explain it further. What web browsers does Scutify support? What is the "Scutify Trending 20 Index" and how does it work? 1. What does the Scutify Trending 20 Index calculate? - The Scutify Trending 20 Index measures the Social Trends of 20 top trending assets selected before the start of a trading week. These assets include(s) Stocks, Commodities and FX. The index value is calculated by combining all the Social Media activity measured by Scutify on these 20 assets and tallying them up to get the index value for that particular day. 2. Why is the Scutify Trending 20 Index so unique and important? - The index does not take into consideration prices (or else it be like any other index out there). It just measures social activity and garners its score from that. It is important because it will show social trends and the spikes and falls and how it correlates with the actual market prices. On Scutify, we show the S&P500 chart overlayed on top of the Scutify Trending 20 Index chart. 3. How often are the components in the Trending 20 rotated? - The components are updated at the end of every trading week and are chosen based on the highest trending assets over the trailing month period. Note: We are still refining this and improving on the collation of the data, so there could be occassional spikes. If you have any questions about the Trending 20 Index, please let us know by contacting us. Follow the following steps to set up your Bitcoin QR Code on your profile page. You will need to have a Bitcoin address, if you do not have one, visit Coinbase.com to set one up. After obtaining your Bitcoin address, simply head over to http://bitcoinqrcode.org/ to generate the QR Code image. 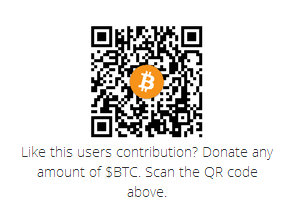 Paste your Bitcoin address into the textfield and then click one of the QR Code images below. A "http://i.imgur.com" URL should appear. Copy that whole URL. Head back to your Dashboard and click on "Edit Details"
....And that's it, that QR Code image is now part of your profile. You can verify it back clicking on your profile name from a Scuttle or a searching for your profile. Screenshot from "User's Profile page"